As young trees or mature shrubs grow large enough, trimming them can become increasingly challenging. Working atop a ladder with a sharp saw is not a particularly safe activity, and it is best to avoid this unless it is unavoidable. Fortunately, you can usually avoid ladder work—or at least minimize it—by using one of the handy pole pruners available. These can range from simple scissor-type pruners mounted on the end of a pole, to manual pruning saws mounted on extension poles, to small, lightweight battery-operated power chainsaws mounted to sturdy fiberglass extension poles. Even though you won't be normally be working on a ladder, it's still important to work safely when using a pole pruner or pole saw. Wear proper safety gear (eye protection, a sturdy plastic hard hat, work gloves, and long sleeves) when working. Avoid working directly under the limbs and branches you are trimming. And be prepared to dispose of the branched legally after you're done. Whatever the size of your project, there's the correct pruning pole for you. From ropeless pole pruners to cordless chainsaws, here are the best tools to tame those branches. Older-style pole trimmers had wooden handles, and this style is still available, usually as a bargain-level tool. But pole pruners with fiberglass handles will be lighter and more durable and are almost always worth the slightly higher price. Ropeless pole pruners are lightweight pruners that are perfect for beginners and are best for pruning smaller branches that are 1 inch in diameter or smaller. 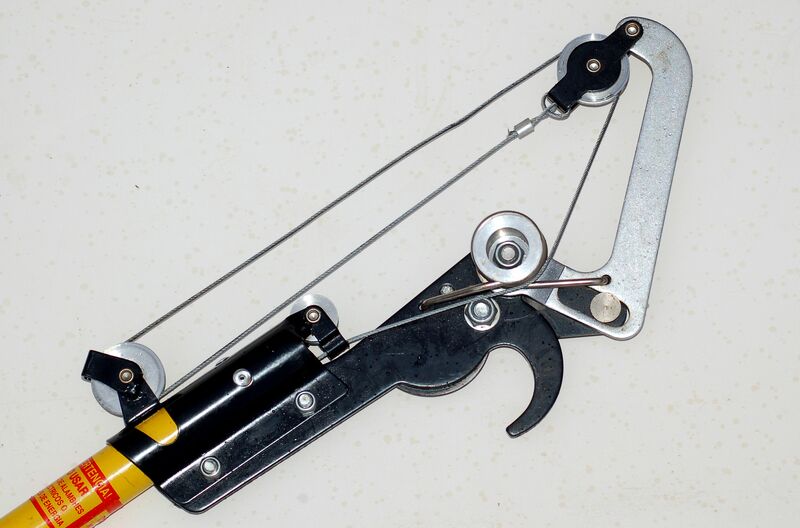 To use this type of pruner you must raise the hook end up into the canopy of the tree to be pruned. Then, let the hook nestle right over the branch to be trimmed while keeping the tool stable with your non-dominant hand. With your dominant hand, pull down on the bottom of the bottom of the pole to engage a cable/sliding mechanism, which scissors the blade around the branch to make the cut. When finished, simply release your pressure on the pole and the cutting mechanism will spring open again. This tool works quite well for tidying up a tree or tall, large shrub. Several variations of this tool exist, some with handles fixed at roughly 6 feet in length, others with telescoping poles that are adjustable between 7 and about 12 feet. Some models feature handles or other mechanisms that pinch the cutting jaws closed. A classic manual pole pruner has a curved pruning blade about 12 to 16 inches long mounted on the end of the adjustable pole. The curve of the blade, combined with its very sharp teeth, makes it amazingly effective at cutting through green or dead wood even when the pole is at its greatest length. The sawing action is primarily on the pull stroke, which quickly becomes apparent when using the tool. It's a bit of a workout, but these saws can cut through limbs up to about 8 inches relatively quickly. When the blade becomes dull, simply replace it with a new blade. Many manual tree pruners come in sets containing two sections of fiberglass pole (or a single telescoping pole) and one or more cutting heads. The heads are interchangeable so you can switch from a saw to a pruner-type cutter, which is operated with a rope that closes the pruning jaw around the limb. Some pruners have combination heads with a saw and a pruner-type cutter (see above) in one unit. Saw heads typically include a hook at the base of the saw. The hook is handy for pulling down cut branches or pushing them free of other branches, or even for directing the fall of large limbs. Models with telescoping fiberglass poles typically adjust from 8 to 16 feet or so. Electric pole trimmers are a cross between pole pruners and conventional hedge trimmers. Both corded and cordless models are available. Their blades are similar to traditional hedge trimmers, but here the motor and trimming head are mounted on the end of a pole to give you more reach. Many have a limited range of adjustability, and can expand up to about 8 feet in length. The cutting head can be swiveled and locked in place, making it possible to trim the tops of tall hedges perfectly flat while standing on the ground. These extra features come with extra weight, so this trimmer is a bit heavier than a standard hedge trimmer. This trimmer is best for trimming extra tall hedges without a ladder. They are not long enough for most tree trimming, and you should avoid the temptation to mount a ladder to use this tool. There are other trimmers more appropriate where a longer reach is needed. But if you have tall hedges that need regular trimming, this is an ideal tool. Whether corded or cordless, electric pole chainsaws are great specialized tools for more extensive tree pruning work. With a 2-in-1 detachable pole and chainsaw, this is the perfect tool for hard-to-reach branches up 10 to 15 feet above the ground. These pruners are also great for cutting larger branches, 1 to 6 inches in diameter, that traditional pruners can't handle. These are somewhat heavier tools, so the extension poles usually max out at about 8 to 10 feet in length. From a standing position, they can give you a reach of about 15 feet. If you do not do a lot of tree trimming, this product might not be worth the investment. But if you live on a wooded property, a pole chainsaw might be an indispensable tool.